Been awhile since we’ve had a guest star, might as well be Thor, right? Oh bearded brethren, three panels is not enough. Turns out Iceman was trolling over in Thor #378 and Loki’s gotten more revenge on his X-enemies by amping up Bobby’s powers. As he struggles to get into the X-Factor complex, his misplaced humor notes Beast’s “yuppie suit” and Beast tells him the bad news about Angel. While attending the funeral, they’re greeting by protestors on both sides of the aisle that would make Wesboro Baptist cringe. They’re preyed upon by that snarky television reporter who’s deflected by an equally snarky Cameron Hodge. Bobby’s about to put her on ice (no thanks to Loki’s shenanigans) but thankfully Leech’s powers cover up his mutant powers. Also joining us for a couple of panels are Apocalypse and three of his Horsemen, a fourth on the waiting table. Apocalypse is sounding pretty sure of himself, too. Pretty creepy setup. Hodge is spouting a lot of anti-mutant rhetoric back at the base, which isn’t well received by the rest of X-Factor. Sure, they’re in disguise, but he’s around friends. Right? Turns out someone is calling in terroristic threats under the guise of the X-Terminators. It’s up to X-Factor to find this “Rictor” character and show the people what’s up. Cyclops is up on the roof having a bit of a moment with his ghosts, all of which can only be cured by Jean Grey. Boom-Boom tries to enlist the help of Beast, but her pleas go unheard. She sets of a bomb and escapes, which takes us to issue #3 of Fallen Angels. (Don’t worry, you aren’t missing much. HORRIBLE read.) Outside Cameron Hodge’s office, the team’s trainees are finding something very weird is going on. Caliban chips in to help find this seismic mutant, Rictor, and he gets his own snazzy X-Factor uniform. They locate him using the epicenter of his earth-based attacks, but are set upon by ‘copters. It’s funny how they shorten this word for some reason. 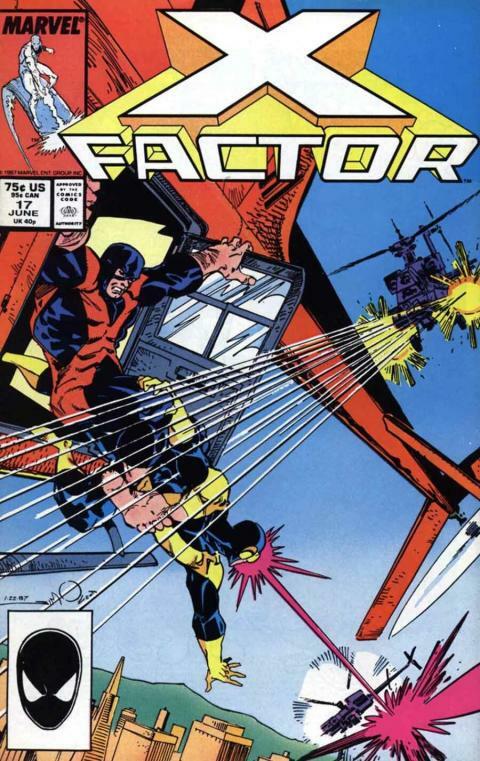 X-Factor saves the day (did you have any doubt) and spoils the plans of Cameron Hodge as Iceman spouts off against the police who want to arrest them when all they did was stop a mutant from going crazy. A tortured mutant, at that. Looking forward to seeing how smarmy Hodge gets in the upcoming issues.